This time, I will introduce essential and useful shortcuts and tips for modelling. Some have been shown in the previous articles, but the others have not been introduced before. So please make good use of them. It’s been used many times before so I have nothing to say more, but, just in case… In the Edit mode, with vertex, edge or face selected, press the ‘E‘ key to extrude. We use it as a prime function for modelling. There is a useful technique when using ‘Inset’. When you select multiple faces, it normally insets all the faces together. However, by checking ‘Individual’ in the left menu (you can display it with the ‘T’ key), the ‘Inset’ function is applied to each face individually. Once ‘Individual’ is checked, it’s applied to all following operations. So, if anything goes wrong, undo with ‘Ctrl+Z’ and use the ‘Inset’ again. In the Edit mode, you can place an edge loop on the object with ‘Ctrl+R‘. ‘Ctrl+R+[number key]‘ can change the number of cuts to create. After ‘Ctrl+R’, you can cut at the middle of the object by double-clicking the left button. Alternatively, you can click once, move the mouse and click the left button again to cut at the position you want to cut. ‘Loop Cut’ not only increase faces and edges for editing but also highlight a boundary on a smooth surface. For example, as seen below, the Subdivision Surface Modifier could smooth out the entire shape of a hat. In this kind of cases, Loop-cut can highlight the boundary between the brim and the crown. ‘Bevel’ is also a frequently-used function. When you want to bevel the entire object, you can use the Bevel Modifier. But, when you want to bevel an edge, press ‘Ctrl+B‘ with the edge selected and move the mouse to adjust the depth of the bevel. In addition, you can increase the number of edge loops along the bevel’s face to create smoother shape by using the mouse wheel before confirming the bevel. And, you can also use ‘Bevel’ to highlight the smoothed corner in the same way as you did with ‘Loop Cut’ earlier. It means both functions can highlight a shape feature by inserting edges. In the Object mode, you can duplicate an object by pressing ‘Shift+D‘ with the object selected. By pressing X, Y or Z after ‘Shift+D’, you can move the duplicated object in the selected direction. In addition, you can duplicate a vertex, edge and face in the Edit mode. When you want to join separate objects into one, you can do it by pressing ‘Ctrl+J‘ with those objects selected. If the origin of the object moved to a wrong place when joining, select ‘Origin to Geometry’ on the Tools tab in the left menu (you can display it with the ‘T’ key) to move the origin to a correct position. This merges the selected vertices into one. Select the vertices to merge and press ‘Alt+M’ to merge. In the menu brought up when pressing ‘Alt+M’, ‘At First’ joins the selected points at the vertex selected at first, ‘At Last’ joins them at the selected at last and ‘At Center’ joins them at the middle of the selected vertices. Select vertices or edges you want to create a face with and press the ‘F‘ key to create the face by filling the region surrounded with the selected vertices and edges. F stand for ‘Face’. There is another useful technique. When the part where you want to create a face forms a ‘loop’, you can fill it in stages by pressing the ‘F’ key repeatedly. Furthermore, when you want to fill the curved surface, it’s very useful that you can fill it with faces by selecting the surrounding edges, pressing ‘Ctrl+F’ and selecting ‘Grid Fill’. It’s so handy, isn’t it. By the way, you can also create an edge by selecting two vertices and pressing the ‘F’ key. Use this when you cut up a polygon. In the Edit mode, you can enable ‘Knife’ by pressing the ‘K‘ key. Then, draw the cut line with the left clicks and confirm it by pressing the Enter key when finished.once finished. Press the ‘B‘ button and draw a rectangle area while holding down the left mouse button to select a larger area. By selecting a vertex/edge/face with the Alt key held down, you can select an edge loop/face loop. When you want to move a vertex or edge along the mesh surface, you can do it by pressing the G key twice. It’s handy. 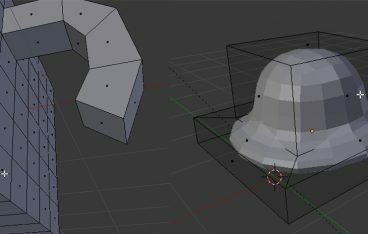 When joining objects with ‘Ctrl+J’, the joined object often has some meshes with their normals flipped without any apparent reason. I don’t know why it happens exactly. I usually found it when importing objects into Unity. If you found flipped meshes, select the flipped faces and press ‘Ctrl+N‘ to flip them back to the correct direction. By the way, you can hide/unhide normals with ‘Normals‘ under the ‘Mesh Display’ section in the menu that you can toggle with the N’ key. You can invert a selection with ‘Ctrl+I‘. While the S key scales the selection in the standard way, the Alt+S key scales it along its normal. By selecting a mesh and pressing ‘Ctrl+L‘, you can select all the meshes linked to it. It’s very useful to select the entity that is difficult to select such as the inside of the object. ‘Bridge Edge Loop’ bridges two separate ‘Edge Loops’ by generating faces in between. Select the faces to bridge, press ‘Ctrl+E’ to bring up the menu and select ‘Bridge Edge Loops’. It works only for faces in a single object, So, if each face belongs to a different object, join them together before applying ‘Bridge Edge Loops’. When extruding an angled edge, the extruded face still has an angled edge. If it’s extruded along the Y-Axis, you can straighten it by pressing ‘S > Y > 0‘. If it’s extruded along the X-Axis, press ‘S > X > 0‘. I guess it works by scaling the edge by the factor of zero. Although it doesn’t work for some cases, it’s a still useful technique. You can delete (or merge?) the duplicated vertices by selecting all the mesh with ‘Ctrl+A’, pressing ‘Ctrl+V’ and selecting ‘Remove Doubles’ (I used to merge them one by one until I learnt this function…). You can smooth vertices by displaying the menu with ‘Ctrl+V’ and select ‘Smooth Vertex‘. They become smoother progressively by applying it repeatedly. That’s it for now! Although I have not been on Blender for a long time, there are a lot of shortcuts I should have learnt earlier. As it’s difficult to memorize all the shortcuts at once, just remember what kinds of functions are available at first. When you actually use them, you can read this article again to remember the details of the shortcuts. Keep doing it and you will memorize them naturally! Blender has a lot of shortcuts, so it’s hard to remember them. But, once you get used to them, you will find them useful. Let’s keep learning together!